OMG! Just gorgeous! I love the basket! Spring is so welcome this year. Lovely photos. The phlox in the basket is a great idea - looks very dainty. Pretty! I love phlox - wished it would bloom longer. Beautiful flowers you have blooming there. Great idea for the basket. Flocks in a basket ... I've never seen that before but I like it! The black Tulips are awesome. I REALLY like the mossy stuff growing between the slate walkway too! Thanks for stopping by my blog, Terri! That's some basket! Beautiful! Isn't it nice that Spring finally arrived?!!!! We've been thinking about putting phlox in somewhere, here. It is so pretty. Beautiful mosaic, love the phlox in the basket. Have a wonderful week and take care. Love the plant between the stones and the basket. Me again! 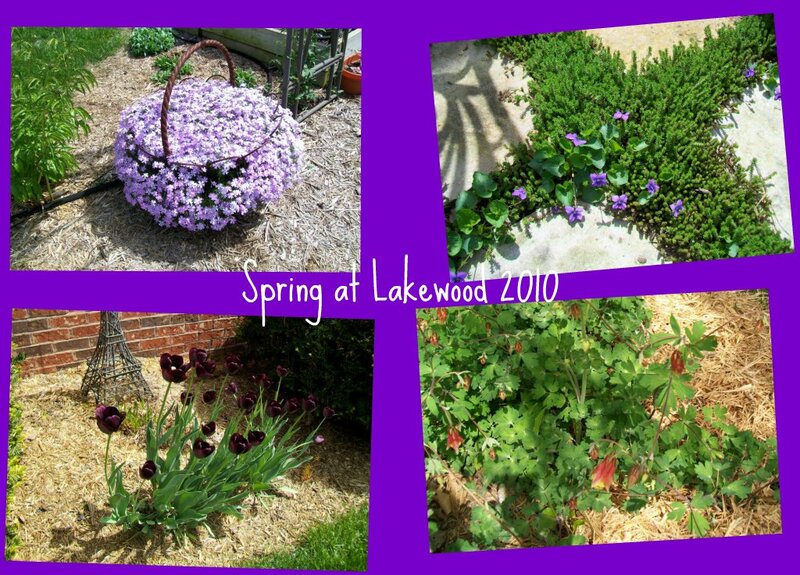 :) I made the mosaic like that thru Picasa. When in the collage section, there is a tab at the top to set as "background" picture. Click the desired picture first, then the tab. Gorgeous mosaic and thanks for stopping by My Dream Canvas!! Beautiful flowers!! Ya gotta love spring!!! A beautiful spring mosaic.Thanks for stopping by. Great mosaic, looks like a lot of work to keep your garden looking so nice. Such a wonderful time of year for all of us flower enthusiasts! How glorious! I would love to see more of your lovely gardens. Your gardens are beautiful! Enjoyed your mosaic of all the pretty blooms! Gorgeous flowers and plants, I love the tulips. Your mosaic is beautiful. Pretty purples, but I love the "high school sweethearts" most of all. Flowers are lovely. Love the basket with the creeping phlox. love the basket.. What a pretty post .. The color of those tulips is wonderful! Love that deep purple. Love the idea of the creeping phlox in the basket!! Thanks for the ideas, I love purple flowers by the way! !